Nothing says luxury like velvet. 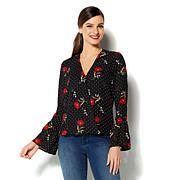 This head-turning top elevates any outfit to special-occasion status. 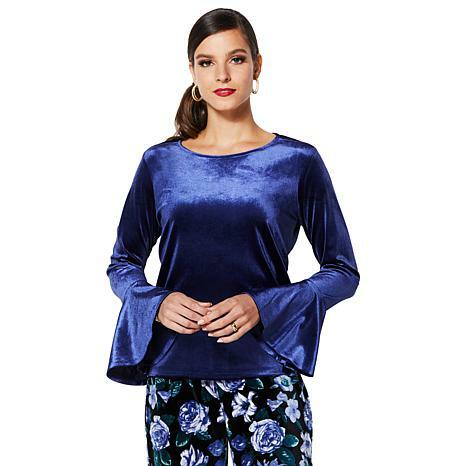 Gorgeous top, brilliant color, stylishelegant bell sleeves at good length, soft material, comfortable fit, great for holidays and special occasions. Purchased 3 colors. Love it!! I Love Every IMAN Item I have purchased for The Last Ten Years.Always Classic..Stylish..Beautiful..Affordable!Thank you IMAN and HSN! 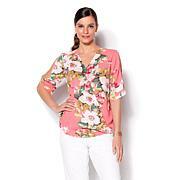 I like everything about this top except the hem keeps rolling up. Reason for one star taken off. I love it enough to keep it thou. 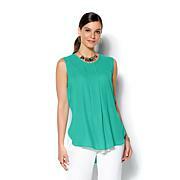 This is a lovely top and I got it in teal but when I got it at home and looked at it it wasn't that teal color that I was hoping for it was more green so for that reason that's why I gave it a four star but still a lovely top. On the TV it made it look really teal color but unfortunately it wasn't sometimes you never know from TV to upfront real.